Worst thing ever. | American McCarver. Your Sports Blog. I have found the worst thing ever. 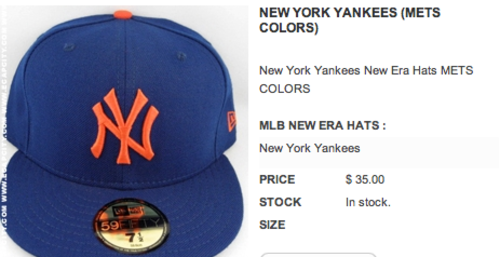 A Yankees cap in Mets colors. Who would buy such a thing? Who would wear it? I am willing to bet my signed Dan Pasqua bat that there is not a person on this earth who declares an allegiance to both teams. And if there is, that person is a jerk because that’s not how rivalries work. That’s not how life works. Do you think you would ever see a Crip wearing red? A Waffle House employee wearing an IHOP t-shirt? I want the name, address and phone number of every person who spent $35.00 on this cap so I can personally berate them. Wait… There are two baseball teams in New York? I’d chip in for one for Gruber. He NEEDS this. It’s funny. My eyes don’t even see this. I just see a white spot where the image is supposed to be. See, my eyes just see a Mets hat with a screwy logo.